Foster an eco-friendly beauty routine. Since the environment directly affects the condition of your skin, it’s important to have an eco-friendly beauty routine. The first step in changing your regimen is to use less water when taking a shower and washing your face. The next step is moisturizer. If your epidermis is oily, you may want to switch to a serum or go for an oil-free sunscreen for protection. If you have dehydrated skin, consider a heavier natural moisturizer such as products with jojoba, almond or Vitamin E oils. Also consider using vegan beauty products or products that have not been tested on animals. For more information, check out The Coalition for Consumer Information on Cosmetics’ site at LeapingBunny. Another great way to green your primping session is to reduce the amount of cosmetics and toiletries you use. People often overuse moisturizer; a pea size is all you need. If you want that last drop of toothpaste, cut open the tub with a pair of scissors and voila! Next, choose items that have refillable packaging. Jane Iredale Cosmetics offers refillable compacts for the pressed powder foundation in order to be more eco-friendly. Now, more than ever, products are claiming to be organic, but you should still be cautious. The USDA is the only group that certifies if a product is organic. The FDA under the cosmetics office has not tightly regulated the personal care industry yet, therefore, many companies use “organic” or “natural” very loosely. 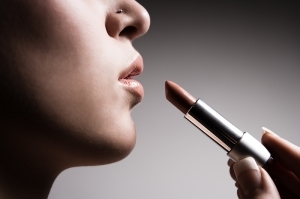 If you want to check a product, go to the Campaign for Safe Cosmetics. Main ingredients to watch out for include parabens, DEA, propylene glycol, phthalates, sodium lauryl sulfate or sodium laureth sulfate. Other chemicals to avoid are dimethicone and sodium hydroxide. These chemicals are being linked to cancer and several skin disorders such as eczema or psoriasis. Outside of what you eat, 80 percent of what is applied to your skin is absorbed directly into your body. From my own experience as a professional many of the chemicals in personal care products also cause allergies. Greening and detoxifying your beauty routine not only saves your money, it also ensures a better quality of life in the long term. Valerie Mason-Robinson, also known as the Green Beauty Queen, is the CEO and Founder of the eco-conscious beauty company Eden Organix. As a former cosmetic researcher at MIT, chemical engineer and a licensed esthetician, Mason-Robinson is a leading expert on “green,” organic and natural beauty products. Learn more at www.edenorganix.com.